STORRS, Conn. - The UConn women's ice hockey team had great scoring opportunities on Friday night against No. 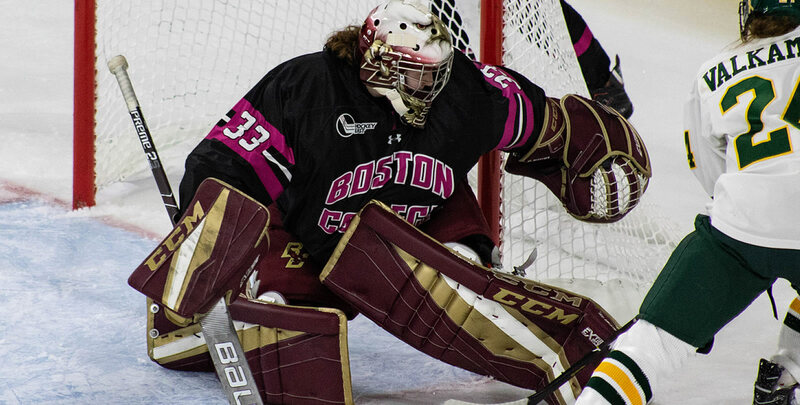 4 Boston College, as well as a 32-save performance by junior goaltender Morgan Fisher, but the Eagles came out on top with a 3-0 win at the Freitas Ice Forum. Playing for the second time in two weeks, the Huskies (6-6-1, 3-5-1 WHEA) battled tough with the Eagles (9-3-0, 6-1-0 WHEA) for the majority of the game - failing to capitalize on key chances in the loss. Sophomore forward Natalie Snodgrass had a team-high three shots on net, including a good look just two minutes into the second period off a cross from senior Catherine Crawley that was saved by Eagles' goalie Maddy McArthur. It is the third loss in the last four games for the Huskies, who came off an impressive 4-1 win over Maine last Saturday in Hockey East action. Boston College took a 1-0 lead with four minutes remaining in the first period off a goal from Caitrin Lonergan, who beat Fisher on a breakaway opportunity. Earlier in the period, junior Briana Colangelo fired a shot off the post, while Crawley had a breakaway chance halted by McArthur. In a scoreless second period, Snodgrass had the best opportunity with a rocket one-timer off a pass from Crawley, which was snagged by a diving McArthur to keep the Eagles' lead intact. With three minutes left in the period, junior Tristyn Svetek had a breakaway shot knocked away by the BC goalie. Boston College was called for a tripping penalty at 12:40 in the third period, but the Huskies were unable to take advantage. Seconds later, the Eagles tallied again on a score from Makenna Newkirk to make it 2-0. Olivia Finocchiaro finished the scoring for the Eagles at 5:12 with one more tally, making it a 3-0 result. The Huskies were outshot, 35-17, but had their opportunities - including one from freshman Danika Pasqua in the final period. UConn and Boston College get a rematch tomorrow in Chestnut Hill, Mass., with puck drop scheduled for 2 p.m. The Huskies look to salvage the season-series with the Eagles before taking part in the Nutmeg Classic after Thanksgiving Day.